This is another question we get rather frequently. The short answer? It depends. Some clients require the full range of our services, while others may have already had some of these done in their own country, like for instance the industrial design work. Regardless of what stage you’re project is at, one thing is certain: you can expect significant savings having your device not only manufactured in China or Taiwan, but also developed here. 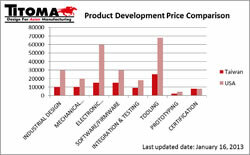 Consider the graph below comparing design, development, and manufacturing costs in the US and Taiwan for a typical custom embedded device featuring an LCD screen. From this example, you can see that savings of over 50% are achievable.These costs already include the management of Titoma, to make sure that the various component suppliers, mold makers, hard and software engineers communicate with each other effectively, and above all: deliver according to your expectations. Costs will of course heavily depend on the complexity and size of the product. For a simple small gadget, Titoma’s budgets to do everything needed start at $65,000 of Non-Recurring Expenses (NRE), which includes engineering, mold making (for the housing of the device), prototyping, and certifications. Larger products with a lot of programming run in excess of $100,000. And, if you haven’t already heard, volume is king in China, and few factories in China are willing to take orders below 5,000 pieces. At Titoma we realize that especially on shorter run products the NRE investment weighs heaviest, so we also help our clients do lower quantity projects, as long as the first order is worth at least US$50,000.